Neuronal Ceroid Lipofuscinoses (NCLs), commonly known as Batten disease, constitute a group of the most prevalent neurodegenerative lysosomal storage disorders (LSDs). Mutations in at least 13 different genes (called CLNs) cause various forms of NCLs. Clinically, the NCLs manifest early impairment of vision, progressive decline in cognitive and motor functions, seizures and a shortened lifespan. At the cellular level, all NCLs show intracellular accumulation of autofluorescent material (called ceroid) and progressive neuron loss. Despite intense studies the normal physiological functions of each of the CLN genes remain poorly understood. Consequently, the development of mechanism-based therapeutic strategies remains challenging. Endolysosomal dysfunction contributes to pathogenesis of virtually all LSDs. Studies within the past decade have drastically changed the notion that the lysosomes are merely the terminal degradative organelles. The emerging new roles of the lysosome include its central role in nutrient-dependent signal transduction regulating metabolism and cellular proliferation or quiescence. In this review, we first provide a brief overview of the endolysosomal and autophagic pathways, lysosomal acidification and endosome-lysosome and autophagosome-lysosome fusions. We emphasize the importance of these processes as their dysregulation leads to pathogenesis of many LSDs including the NCLs. 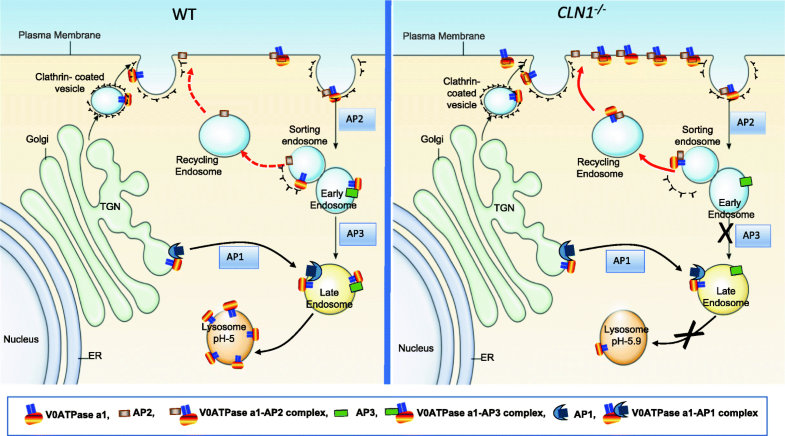 We also describe what is currently known about each of the 13 CLN genes and their products and how understanding the emerging new roles of the lysosome may clarify the underlying pathogenic mechanisms of the NCLs. Finally, we discuss the current and emerging therapeutic strategies for various NCLs. In 1955, Christian de Duve, while investigating the mechanism of insulin action, discovered the lysosome , a membrane-bound organelle which plays critical roles in the degradation and recycling of material delivered to it from both extracellular and intracellular sources [2–4]. Although historically known as the center for cellular waste disposal, the lysosome has since been reported to serve essential roles in such functions as cellular nutrient sensing, energy metabolism and plasma membrane repair. To maintain homeostasis, a network of lysosomal proteins, soluble lysosomal acid hydrolases, lysosome-related organelles, autophagosomes and other cellular constituents are put in place to degrade the material imported into the cell. Impairment of this lysosomal network contributes to a group of diseases called LSDs [5–7]. In most of the LSDs, neurodegeneration is a devastating manifestation . Despite tremendous advances in the field, the precise molecular mechanism(s) underlying these diseases remain elusive. The emerging new roles of the lysosome as the nutrient sensor and signaling hub of the cell may provide a better understanding of the pathophysiology of various NCLs. The lysosome, in addition to harboring the soluble acid hydrolases in its lumen, is endowed with numerous proteins that are localized to its membrane [9, 10]. For a long time, the lysosomal membrane was thought to provide just a barrier between the luminal acid hydrolases and the cytoplasm. However, emerging evidence indicates that the lysosomal membrane serves critical roles in a wide range of cellular functions, including phagocytosis, autophagy, membrane repair and apoptosis . All lysosomal membrane proteins are synthesized in the endoplasmic reticulum (ER) and are selectively transported to the lysosome. The degradative functions of the lysosome are essential for cell clearance, signaling, metabolism and homeostasis. Cellular homeostasis also requires ubiquitylation, a process that facilitates specifying the proteins which are transported to the lysosomal lumen by endosomal sorting complex required for transport (ESCRT) to sort cargos tagged with ubiquitin into the invaginated endosomal membranes . Recently, it has been reported that the ESCRT machinery plays an essential role in repairing injured endolysosomes and thereby providing a mechanism to protect the cells from death. Compelling evidence indicates that the lysosome performs a much broader function than just being the cellular waste disposal. It has critical roles in some of the most vital processes like secretion, signaling, repair of the plasma membrane, and energy metabolism . In addition, the lysosome has an essential role in autophagy [3, 4], which along with its other functions places this organelle at the center of several vital processes, such as nutrient sensing, metabolism and homeostasis . Thus, impairment of lysosomal function has implications for the pathogenesis of all LSDs including the NCLs. Lysosomes receive materials for degradation via three major pathways: phagocytosis, endocytosis and autophagy (Fig. 1). A network of lysosomal proteins, and other cellular constituents contribute to the degradation of the imported cargo delivered to this organelle . In the following paragraphs, we articulate how the endolysosomal and autophagic pathways of degradation require lysosomal acidification and endosome-lysosome as well as autophagosome-lysosome fusions. The lysosome is the terminal organelle for degradation and cellular clearance. Materials from varying locations are delivered to the lysosome for degradation. There are two major pathways by which materials enter the lysosome. These are (i) endocytosis in which the material from outside the cell enters the lysosome via endocytic vesicles originating from the plasma membrane  and (ii) autophagy in which material from within the cell is transported to the lysosome via autophagosomes. It has been suggested that dysregulation of autophagy is a common mechanism in the pathogenesis of the LSDs including several NCLs and other more common neurodegenerative diseases . The endo-lysosomal pathway plays multiple roles in cellular function and homeostasis [17, 18]. This pathway has an important function in enabling the cell to internalize extracellular macromolecules and fluids together with portions of the plasma membrane. It also plays vital roles in the sorting of the internalized membrane and its constituent proteins. The major sorting stations in this pathway consist of the early and late endosomes and pleiomorphic organelles with tubulo-cisternal and multi-vesicular domains, which are packed with intraluminal vesicles . The cargo contained in the endosomes are either delivered to the lysosome where acid hydrolases catalyze degradation or promote recycling back to the plasma membrane via recycling endosomes, or further transported to the Golgi using the retromer complex [20, 21]. In some instances, the endosomes undergo fusion with the plasma membrane, thereby discharging the contents into the extracellular space. These extracellular materials are called the exosomes . The Rab GTPases , which are the major regulators of vesicular trafficking, control the dynamics of sorting, trafficking and membrane remodeling in the endocytic pathway including secretion of the exosomes. Recent investigations have demonstrated how Rab35 and Arf6 might serve as input sensors for two types of endocytosis to balance membrane trafficking to preserve cell surface homeostasis. More recently, it has been shown that lysosomal contact with mitochondria regulates mitochondrial fission through the hydrolysis of Rab7, which allows bidirectional regulation of mitochondrial-lysosomal dynamics . This may explain why lysosomal as well as mitochondrial dysfunction have been observed in various human diseases including the neurodegenerative LSDs like the NCLs. One of the important factors in intracellular digestion is lysosomal acidification, which directly impacts the catalytic activities of the lysosomal acid hydrolases as these enzymes work most efficiently in acidic pH. In virtually all NCLs, except CLN2 and CLN8, lysosomal acidification is reported to be dysregulated [25, 26]. It has also long been recognized that acidification of the endocytic organelles is essential for the degradation and clearance of exogenous and endogenous material delivered to the lysosome via endosome and autophagosome pathways . Lysosomal acidification is regulated by vacuolar ATPase (v-ATPase) [27–29], which is a multi-subunit protein complex consisting of a cytosolic V1-sector and a lysosomal membrane-anchored V0-sector. The v-ATPase acidifies a wide array of intracellular organelles by pumping protons across the membranes into the vesicular (late endosomal/lysosomal) lumen [27–29]. The V1-sector of v-ATPase generates energy by hydrolyzing ATP and this energy is utilized to facilitate the transport of protons from the cytoplasm across the lysosomal-membranes to the vesicular lumen. The recycling of the cell surface receptors, the receptor-ligand dissociation, protein degradation by lysosomal hydrolases, neurotransmitter loading as well as the recycling of synaptic vesicles are all pH-dependent [30, 31]. Moreover, it has been demonstrated that alterations in the intracellular pH alone severely alter organellar morphology, movement and function . Indeed, it has been demonstrated that nanoparticle-mediated correction of lysosomal acidification defects may have implications for lysosomal-related diseases . An orderly execution of fusion of the membranous organelles is vitally important for the eukaryotic cells . For example, the fusion of the autophagosome-lysosome and endosome-lysosome membranes is critical for the degradation of material imported from intracellular and extracellular sources that are delivered to the lysosome . Similarly, membrane fusion plays an essential role in synaptic transmission in the central nervous system in which SNARE- and SM (Sec1/Munc18-like)-proteins have been reported to play critical roles . The v-ATPase, by regulating lysosomal acidification, mediates the fusion of endocytic and autophagic vesicles although the mechanism(s) by which the fusion of these membranes occurs remains poorly understood . Notably, the maturation of the autophagosome precursor has been shown to depend on homotypic membrane fusions . Autophagy is a major degradative pathway in the cell [3, 4]. There are three different types of autophagy: (i) macroautophagy, (ii) microautophagy and (iii) chaperone-mediated autophagy. During macroautophagy (hereafter called autophagy), the cytoplasmic contents (e.g. long-lived proteins and disabled or aged organelles) are encircled by a double-membrane structure called the autophagosome [3, 4]. An autophagosome is a double-membrane structure, originating from the ER-mitochondria contact sites, called a phagophore, which encloses long-lived proteins, aged and disabled organelles, and aggregated proteins. Autophagosome fuses with the lysosomal membrane generating a hybrid organelle called autolysosome in which the acid hydrolases degrade the cargo. 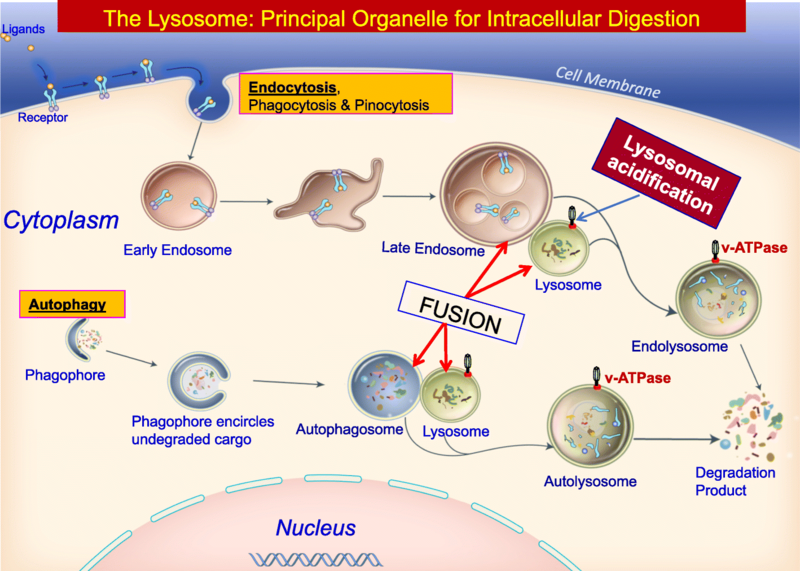 At the final stage of cargo-degradation, each type of autophagy requires the fusion of autophagosomes with functional lysosomes . In recent comprehensive reviews [39, 40] the molecular definition of autophagy and autophagy-related processes as well as how their dysfunction may lead to neurodegeneration has been described. It has become increasingly evident that impaired autophagy is associated with several human neurodegenerative diseases including neurodegenerative LSDs like the NCLs [16, 40, 41]. Membrane fusion is an essential requirement for early biogenesis of autophagosome and degradation of cargo in the lysosome and this vital process is impaired in many neurodegenerative diseases [4, 40, 42]. Impaired membrane fusions have been reported in the LSDs as well as in common neurodegenerative diseases [43, 44]. Thus, fusion of these organelles is particularly important for maintaining neuronal survival as impaired autophagy causes accumulation of several aggregate-prone proteins (e.g. huntingtin, α-synuclein), which are potentially harmful to the neurons [44, 45]. Despite intense investigations the physiological functions of the mutant genes underlying various forms of the NCLs remain poorly understood. In the following paragraphs, we describe what is known about these genes, the proteins they encode and how the emerging new roles of the lysosome may advance our understanding as to how mutations in these genes may impair lysosomal function. Commonly known as Batten disease [46–52], NCLs constitute a group of the most common inherited neurodegenerative LSDs that mostly affect children. Lysosomal accumulation of autofluorescent material (called ceroid), increased neuronal apoptosis, dysregulated autophagy, neurodegeneration and shortened lifespan are some of the common features shared by all NCLs. Our knowledge that the lysosome functions as a nutrient sensor and the signaling hub of the cell [12–14, 53–56] may be applied to facilitate a greater understanding of the pathogenic mechanism(s) underlying the NCLs. The 13 different genes (Table 1), mutations of which cause various forms of NCLs, may be classified into four groups according to the proteins they encode. The group I genes (CLN1, CLN2 CLN5, CLN10 and CLN13) encode lysosomal soluble proteins/enzymes. The group II genes (CLN3, CLN7 and CLN12) encode membrane proteins but two of the genes (CLN6 and CLN8) encode ER-membrane proteins. The group III genes (CLN4 and CLN14) encode soluble proteins and one gene in group IV (CLN11) encodes a protein in the secretory pathway [46–52]. A summary of the proteins encoded by all CLN genes is provided in Table 1. In Table 2, The CLN gene mutantions underlying pathophysiological manifestations of various NCL forms are provided in Table 2. The discovery of an enzyme in bovine brain, its purification to homogeneity and the demonstration that it catalyzed the cleavage of the thioester linkage in palmitoyl-CoA and S-acylated H-Ras in vitro  paved the way for the identification of the mutant gene (now called CLN1) . Inactivating mutations in the CLN1 gene underlie infantile NCL (or INCL), also known as Santavuori-Haltia disease . The CLN1 gene encodes palmitoyl-protein thioesterases-1 (PPT1) , a soluble depalmitoylating enzyme, which is essential for the degradation of S-acylated proteins by lysosomal hydrolases . Numerous proteins in the central nervous system undergo S-palmitoylation (or S-acylation), a process in which a 16-carbon fatty acid (predominantly palmitate) is attached to specific cysteine residues in polypeptides via thioester linkage . It is the only reversible lipid modification that has emerged as an important regulatory mechanism for many proteins, especially in the brain [63, 64]. These S-acylated proteins require depalmitoylation by thioesterases prior to degradation by lysosomal acid hydrolases . Thus, PPT1-deficiency impairs lysosomal degradative function causing intracellular accumulation of S-acylated proteins leading to INCL. At birth, the children afflicted with INCL are phenotypically normal. However, by 11-18 months of age they manifest signs of psychomotor retardation. By 2 years of age, these children are completely blind due to retinal degeneration. Around 4 years of age, an isoelectric electroencephalogram (EEG) attests to a vegetative state, which may last for several more years before eventual death . It has been reported that CLN1 mutations can also cause milder forms of INCL, which may manifest as late infantile, juvenile, or adult phenotypes [65, 66]. Although the precise biological roles of PPT1 and its in vivo substrates remain unidentified, a recent report suggested that cysteine string protein-α (CSPα) may be an in vivo substrate of PPT1 . Notably, it has been demonstrated that in vitro, PPT1 depalmitoylates S-acylated growth associated protein 43 (GAP-43) and rhodopsin and its catalytic activity is higher at neutral pH (7.4) rather than at acidic pH (4.0) suggesting that PPT1 may have extra-lysosomal functions. Altered lysosomal pH has been reported in several NCLs including INCL . It has recently been demonstrated that in Cln1-/- mice, V0a1, a critical subunit of the v-ATPase (the proton pump of the cell) that regulates lysosomal acidification, requires S-palmitoylation for its lysosomal targeting . Notably, in Cln1-/- mice lacking Ppt1, V0a1 is misrouted to the plasma membrane instead of its normal localization on the lysosomal membrane (Fig. 2). This defect inhibits v-ATPase activity and consequently, alters the lysosomal pH in Ppt1-deficient cells . Numerous studies have shown that both physiological and pathological conditions disrupt protein folding in the ER leading to the accumulation of these misfolded proteins, which cause ER-stress . Increased ER stress activates a signaling network known as the unfolded protein response (UPR) to suppress protein synthesis . In a wide variety of pathological conditions, including GM1 glycosidosis  and INCL , high levels of ER-stress have been reported to cause neuron loss. In response to ER stress, the protein-folding and degradation capacity of the ER is dynamically adjusted by the induction of the UPR . Several comprehensive reviews have been published describing the prevalence of the UPR in the nervous system and its functional link in neurodegeneration [69, 71]. In Cln1-/- mice, ER- and oxidative-stress have been shown to cause caspase activation leading to neuron loss by apoptosis [72–74]. Recently, a comprehensive review on ER-stress and UPR in various LSDs including the NCLs has been published . Mutations of the CLN2 gene encoding tripeptidyl-peptidase 1 (TPP1) underlie pathogenesis of late infantile NCL (LINCL) or CLN2-disease . TPP1 is a lysosomal protease that requires acidic pH for its activation. Moreover, inactivation of the aminopeptidase activity of TPP1 impairs the removal of tripeptides from the N-terminus of small proteins leading to CLN2-disease [77, 78]. Children with LINCL are phenotypically normal at birth but around 2-4 years of age the disease manifestation occurs, and they succumb to the disease when they are around 6-15 years old. Like cathepsin D (CTSD), a lysosomal aspartyl protease, TPP1 is synthesized as an inactive proenzyme (pro-TPP1) in the ER. It is then autocatalytically processed to the active enzyme in the acidic pH of the lysosome requiring Ca++ [79, 80]. The CLN2 gene is ubiquitously expressed and developmentally regulated . In the human brain, TPP1 is expressed at a high level starting at 2 years of age  and in mice and rats, the highest expression level is reached at adulthood . Like most of the NCLs, the management of the patients with CLN2-disease is palliative. It requires a multidisciplinary approach as the disease has a complex array of symptoms and its progression is generally rapid. Moreover, because of the rapid decline of the medical condition of these patients, it is essential that the patient families are given extensive psychosocial support. An excellent review article has recently been published in which the authors provided a detailed overview of CLN2 disease and the associated complications that might be expected . In both CLN2- and CLN3-diseases, endosomal/lysosomal trafficking as well as autophagy are reported to be dysregulated . These abnormalities in CLN2-deficient cells may stem from oxidative-stress, which upregulates the PI3/Akt pathway activating the mechanistic (mammalian) target of rapamycin complex 1 (mTORC1) . Using induced pluripotent stem cells (iPSCs) from normal subjects and CLN2 patients, it has been shown that the earliest CLN2 disease events can be recapitulated in the human iPSCs at the pluripotent stage and during neuronal differentiation . Moreover, these authors have reported distinct, yet overlapping, early-stage pathology in multiple subcellular compartments. Furthermore, the results of this study provided the proof-of-principle that establishes a platform for the development of genotype-directed therapeutics for NCL by drug screening in patient neurons differentiated from iPSCs. Remarkably, when the iPSCs were differentiated to neurons, other abnormalities characteristic of the CLN2-disease began to appear . Notably, while LSD features were not detectable in iPSCs, disease-specific storage materials were seen upon neural differentiation of the same cells. Recently, an unbiased exhaustive proteomic analysis of the brain and cerebrospinal fluid from patients with CLN1-, CLN2- and CLN3-disease have revealed significant alterations in the expression of proteins in each of these NCLs . Studies like these are likely to identify biomarkers for these diseases, which are essential for evaluating emerging therapeutic strategies and to determine their efficacy. The CLN3 gene was identified in 1995 and it was reported that mutations in this gene underlie juvenile NCL (JNCL) . It encodes a 438-amino acid transmembrane lysosomal protein with both its N- and C-termini localized to the cytoplasm [89, 90]. The CLN3 mutations as well as clinicopathological spectrums have previously been reviewed . The most frequent disease-causing mutations in this gene, found in patients with CLN3-disease, is a 1 kb deletion that causes removal of exons 7 and 8, which generates a premature stop codon . This mutation results in a substantial decrease in mRNA expression and stability. Therefore, it is likely that the mutant gene expressing a truncated CLN3-protein is not expressed at all . In both humans and mice, the CLN3/Cln3-gene and CLN3/Cln3-protein are ubiquitously expressed . It has been reported that mutations in the CLN3 gene impair loss of vision, cause epileptic seizures, as well as progressive decline in motor and cognitive functions. However, there are reports providing evidence that CLN3-pathology also extends beyond the central nervous system for example, the immune- and circulatory systems [94–96]. Although lysosomal localization of CLN3 has also been reported, it is also localized to the neuronal synapses and growth cones of telencephalic neurons of mice. Furthermore, CLN3 has been shown to colocalize with the SV proteins such as SV2 and synaptophysin [97–99]. Thus, it has been suggested that CLN3 may have a role in endosomal/lysosomal system as well as in neuronal synapses. While the precise function of CLN3 is not yet clearly understood, its localization primarily on late endosome and lysosome is suggestive of its important roles in these organelles [99, 100]. Notably, in CLN3-ablated HeLa cells expressing CD8-tagged CI-M6PR as the reporter, it has been demonstrated that in these cells the exit of CD8-CI-MPR from the TGN is impaired . Recent reports indicate that CLN3 plays a critical role in autophagy and this process is defective in CLN3-disease models . Moreover, using juvenile CLN3 disease patient-derived iPSCs and neural progenitor cells derived from juvenile CLN3 disease it has been shown that autophagy is defective . In addition to its localization on the lysosomal membrane and its role in the function of this organelle, CLN3-silencing has been shown to stimulate proliferation in human colorectal cancer cells . Interestingly, it is reported that the wild, but not the mutant CLN3, binds galactosylceramide suggesting that it may transport galactosylceramide . Moreover, it has also been demonstrated that suppression of galactosylceramide synthase by siRNA in normal cells adversely affected cellular growth and induced apoptosis. Notably, storage of subunit c of ATP synthase has also been reported in all NCLs except in INCL. However, it has been reported that the accumulation of subunit c does not cause the neuropathology characteristic of NCL-diseases . Considering all these observations, it appears that CLN3 mutation adversely affects several cellular processes such as lysosomal pH, endocytosis, autophagy, transport of proteins from the TGN, cell proliferation, apoptosis and synaptic transmission, although it remains unclear what precise biological function(s) CLN3 regulates and what is the mechanism of such regulation. Recently, using human iPSC models of NCLs Lojewski and colleagues  have reported endocytic pathway dysfunction in cells carrying mutations in the CLN2- and CLN3-genes, respectively. Although phosphorylation of TFEB, which prevents its translocation to the nucleus, is catalyzed by mTORC1, it has recently been reported that in a CLN3 disease model, TFEB activation has been achieved by the inhibition of Akt by trehalose, which mediated cellular clearance and neuroprotection . Mutations in the CLN4 / DNAJC5 gene encoding CSPα underlie the adult onset form of NCL also called Parry disease , is a very rare and difficult to diagnose NCL . At least two variants of Kufs disease have been reported . The type A variant is a progressive myoclonus epilepsy with cognitive impairment, and type B variant manifests movement abnormalities with dementia [110–112]. Although most of the NCLs are autosomal recessive diseases, the inheritance pattern of type A Kufs disease (CLN6 mutations) is autosomal dominant . Proper folding of proteins plays critical roles in their function and it has been reported that CSPα acts as a chaperone to facilitate correct folding of proteins . Thus, its localization in the neuronal synapses accounts for 1% of total synaptic vesicle-associated proteins. In the neuronal synapses, α-synuclein (α-Syn) and CSPα are present in abundance . Although it has been reported that dominant mutations in α-SYN gene cause Parkinson's disease, the physiological role(s) of α-Syn remains elusive. Targeted-disruption of the CSPα gene results in progressive neurodegeneration in mice and it has been suggested the co-chaperone function of CSPα is required for the survival of neurons . Remarkably, it has been found that transgenic expression of α-Syn prevents neurodegeneration caused by CSPα-ablation. These results demonstrate not only the neuroprotective role of α-Syn, but also how CSPα works in concert with α-Syn in the nerve terminals to protect the neurons . Interestingly, a recent study has reported that DNAJC5/CSPα and PPT1/CLN1, which is mutated INCL, may be functionally linked . The CLN5 gene encodes a soluble lysosomal glycoprotein of unknown function. Although its mutations were first discovered in the Finish variant of late infantile NCL, they are now reported in both juvenile and adult NCL patients of a wide range of ethnicities [116, 117]. CLN5’s expression varies throughout the body, having the highest levels in the central nervous system and moderate levels in the peripheral organs and tissues. In the brain, it is highly expressed in the cerebral cortex and cerebellum . Similar expression patterns occur in the mouse brain where it is also developmentally regulated. Moreover, it is expressed in the ganglionic eminence and microglia, the latter of which sees very early activation in Cln5-/- mice, which may adversely affect adjoining normal neurons. In addition, CLN5-protein has been reported to localize to the lysosomal compartment  and CLN5 overexpression in COS-1 cells has been shown to interact with CLN1/PPT1, CLN3, CLN6, CLN8, and endogenous CLN2/TPP1 . Although the precise function of CLN5 encoded protein remains unclear, it has been reported that it plays a role in endosomal sorting . Indeed, it has been shown that in HeLa cells, overexpressing HA-tagged CLN5 and myc-tagged sortilin, a lysosomal enzyme transporter, both are coimmunoprecipitated. This suggested an interaction between these two proteins. Conversely, in CLN5-deficient cells the stability of sortilin and CIMPR both declined . The importance of CLN5 in the brain is suggested by its relatively high expression in neurons and microglia . Moreover, patients with late infantile CLN5-disease and in the brains of Cln5-/- mice, defective myelination occurs in the brain . Further investigations are likely to delineate the precise physiological function(s) of the CLN5 gene product. Mutations in the CLN6 gene cause classical and variant late infantile NCL [123, 124]. CLN6 encodes a 27 kDa transmembrane ER-protein of 311 amino acids, which is expressed in virtually all tissues, including the cerebellum and the hypothalamus. However, its biological function(s) remain obscure and there is currently no known protein homologue of CLN6 . The expression of Cln6 is developmentally regulated in the murine brain and mice aged P14 and older express Cln6-mRNA in cells of the cerebral cortex (layers II-VI), cerebellar Purkinje cells and in the dentate gyrus of the hippocampus. Moreover, it has been reported that CLN6 has a role in the regulation of cellular acidification, endocytosis and autophagy [126–128]. CLN6 mutations also manifest characteristic NCL phenotypes in lysosomal storage granules such as intracellular autofluorescent lipopigments (constituent of ceroid), cholesterol and subunit c of mitochondrial ATP synthase (SCMAS) [106, 126]. However, SCMAS are absent in lipopigments of CLN1, CLN4 and CLN10. It remains unclear if SCMAS are present in the lipopigments in CLN11-CLN14. Notably, it has been reported that there is no difference in the total mannose 6-phosphate proteome in brain tissues from patients with CLN6-disease and healthy controls . One of the striking findings in CLN6-disease is the aberrant biometal metabolism, which is also reported in common neurodegenerative disorders such as Parkinson’s and Alzheimer’s . Biometals such as copper, zinc, manganese and cobalt have been shown to accumulate in animal models of CLN6 disease . In Cln6 mutant (nclf) mice, accumulation of these biometals has been reported in the cerebral cortex, spinal cord, liver and heart . Further investigations are required to determine the biological function(s) of CLN6 and how impaired function of this gene leads to the accumulation of biometals and how this defect leads to CLN6 disease pathogenesis. Mutations in the MFSD8 gene cause CLN7-disease, which is a variant late infantile phenotype . Although MFSD8 is ubiquitously expressed at a very low level, its expression in the liver, heart and pancreas is markedly higher. Interestingly, rat neurons, astrocytes and microglia as well as cultured microglial cells showed much higher levels of Mfsd8-mRNA . The abundance of Mfsd8-mRNA was more pronounced in the cerebral cortex and the midbrain and much less pronounced in the hippocampus . MFSD8 is a multispan integral lysosomal membrane protein belonging to the major facilitator superfamily (MFS) of active permeases. These proteins function as transporters of sugars, sugar phosphates, drugs, inorganic and organic cations, amino acids and neurotransmitters across membranes. However, its precise biological function remains unclear. Results from colocalization studies of MFSD8 and lysosomal membrane markers suggest lysosomal localization of this protein . Studies using lysotracker red and Lamp-1 colocalization in HeLa cells with GFP-tagged MFSD8 found similar results . Remarkably, none of the pathogenic MFSD8 mutations had any adverse effect on protein trafficking or lysosomal localization . It has been reported that in Cln7-KO mice, loss of Cln7 in the brain leads to lysosomal dysfunction and impairs constitutive autophagy leading to neurodegeneration late in the disease process . It has also been demonstrated that CLN7-protein is cleaved by lysosomal proteinases generating N- and C-terminal fragments, which are then released in the extracellular space. Loss of CLN7 causes depletion of soluble proteins in lysosomes impairing reactivation of mTOR , which is a potent anabolic regulator of cell growth and metabolism. Further investigations are essential to delineate the specific role(s) of CLN7 in neurons and how MFSD8 mutations may lead to CLN7 disease. In humans, CLN8 mutations manifest two distinct phenotypes. One of these phenotypes is characterized by progressive seizures and mental retardation and the other is a juvenile-onset variant, which is called Northern Epilepsy . The CLN8 gene encodes an ER membrane-spanning protein containing several hydrophobic domains. The protein is reported to shuttle between the ER and Golgi intermediate compartment for recycling. In non-neuronal cells, CLN8 contains an ER-retrieval signal KKRP (Lys-Lys-Arg-Pro) at the carboxy terminal [139, 140]. The naturally occurring mouse model of the disease called mnd (motor neuron degeneration) shows progressive motor neuron dysfunction and retinal degeneration . CLN8-mRNA is expressed ubiquitously with high level expression in cerebral cortex and hippocampus in electrical kindling model of epilepsy . However, the relevance of CLN8 overexpression in this model still needs to be determined. Although the precise function of CLN8 remains unclear, a 200-amino acid (residues 62–262) TLC (TRAM-LAG1-CLN8) domain has been suggested to be essential for ceramide synthesis, glycosphingolipid trafficking  and lipid homeostasis [142, 143]. Of note, a report suggested CLN8 as a genetic modifier after the stimulation of CLN8-mRNA expression in a chemically induced Gaucher disease model . However, the mechanism by which CLN8 expression is induced in this model, which is caused by lysosomal β-glucosidase deficiency, remains unclear. Interestingly, several studies suggested that altered CLN8 function may be linked to ER- and oxidative-stresses (reviewed in ), disruption of calcium homeostasis, defective mitochondrial function, inflammation and apoptosis [145–147]. A recent study demonstrates that CLN8 protein is retrieved from the Golgi complex to the ER via coat-protein I (COPI) and that mutations in the CLN8 gene impairs the transport of lysosomal enzymes such as TPP1 leading to pathogenesis of CLN8-disease . Undoubtedly, further research is needed to understand the mechanism(s) of pathogenesis of CLN8-disease. Mutations in the CLN10 gene cause a severe neurodegenerative LSD called congenital NCL (CNCL) [149, 150]. Clinically, congenital NCL (CLN10 disease) manifests with respiratory insufficiency after birth and status epilepticus, which are followed by death within hours to weeks ( and references there in). The CLN10 gene encodes cathepsin D (CTSD; EC 3.4.23.5), an aspartic protease belonging to the pepsin superfamily. It is associated with several physiological processes such as protein degradation, autophagy and apoptosis . CTSD hydrolyzes a wide variety of substrates including the extracellular matrix proteins fibronectin and laminin. However, the in vivo substrates of this enzyme have not been clearly identified although it has been reported that CTSD catalyzes the cleavage of α-synuclein , a protein associated with Parkinson’s disease. Human subjects with CLN10-disease either die prenatally or within a few weeks after birth. Typically, these patients present with microcephaly and seizures and unlike other forms of NCLs they lack the progressive cognitive/motor or visual deficits [153, 154]. Sporadic mutations in the CLN10 gene causing CTSD deficiency in sheep have been reported as congenital ovine NCL  and in American bulldogs . Mammalian CTSD is synthesized as a 53 kDa pre-pro enzyme protein . The pre-pro-CTSD is first proteolytically processed to a 48 kDa proenzyme, which then is transported through the endosomal pathway to the lysosome. Here the proenzyme is further processed by the proteolytic actions of cathepsin B and L, generating a 31 kDa and a 14 kDa fragment; non-covalent dimerization of these two fragments constitutes the mature, catalytically active-CTSD enzyme . Variable pH optima have been reported for CTSD but maximal enzymatic activity is manifested at a pH optimum of 3.5 (26). Purified CTSD from porcine spleen has shown a pH optimum near 3 and 4, which has been reported to vary with salt concentration . Several animal models with inactivating mutations in the CLN10/CTSD gene manifest CNCL phenotype. Targeted-disruption of the Cln10/Ctsd gene has been reported to cause an early-onset NCL phenotype and progressive neurodegeneration in mice and Drosophila [159–162]. It has also been reported that CTSD-processing is defective in lysosomes derived from the brain of Cln1-/- mice, which suggests that lysosomal deficiency of enzymatically active CTSD is a common pathogenic link between INCL and CNCL . The CLN11 gene encodes progranulin (PGRN). In 2012, mutations in the PGRN gene were first reported in two siblings suffering from an adult-onset NCL . PRGN was originally described as a growth factor that regulates wound healing, vasculogenesis and tumor growth . However, in 2006, landmark studies showed that mutations in the GRN gene also underlie a familial form of frontotemporal lobar degeneration (FTLD) with distinct neuropathological features consisting of ubiquitin-positive protein aggregates in the nucleus and cytoplasm of cortical neurons . Subsequently, these aggregates were found to be enriched in TAR DNA-binding protein-43 (TDP43) . Moreover, it was discovered that patients with homozygous GRN mutations developed NCL-11 [164, 168]. Interestingly, while heterozygous mutations in the granulin gene (GRN) in older adults lead to haploinsufficiency in PGRN, which causes FTLD, homozygous mutations in the GRN gene lead to complete PGRN loss, which causes CLN11-disease in children . However, the cause of the differential pathologic manifestation remains unclear. Within the central nervous system GRN-mRNA is expressed in a variety of cell types including neuron, microglia, astrocytes and endothelial cells . Despite its potential role in lysosomal function, the presence of a secretory signal in the N-terminal of GRN protein facilitates its regulated secretion . Interestingly, microglial activation enhances progranulin expression and significantly impacts neuronal function and synaptic density . Extracellular progranulin can bind to multiple receptors including sortilin, which transports it to the lysosome . Progranulin also binds to TNFα-receptor  as well as the ephrin type-A receptor (EPHA2) on the cell surface and such interactions activate tyrosine kinase activity of EPHA2 and downstream kinase Akt . This may suggest that signaling pathways downstream of Akt may also be activated by progranulin. Although PGRN has been shown to be transported to the lysosome via sortilin , its function(s) in this organelle remains unclear. In macrophages, granulins, cleaved from PGRN, bind to CpG oligodeoynucleotides in lysosomes, enabling Toll-like receptor-9 signaling . Recently, it has been reported that in the mouse traumatic brain injury model, PGRN prevents lysosomal dysfunction . Most notably, the expression of PGRN is significantly elevated in activated microglia after traumatic brain injury. The elevated lysosomal biogenesis in activated microglia, which increased cerebrocortical neuron damage, reduces lysosomal biogenesis [54, 179]. It has been reported that PGRN-deficiency causing lysosomal dysfunction can be explained based on lipidomic and transcriptomic considerations . In a recent comprehensive review, Paushter and colleagues have provided new insights into the lysosomal function of PGRN and its link to multiple neurodegenerative diseases . More research would be needed to advance our understanding of the role of PGRN in the pathogenesis of CLN11- and FTD-diseases. The CLN12 disease is caused by loss of function mutations in the predominantly neuronal P-type ATPase (ATP13A2) gene. The CLN12 (ATP13A2) gene is also known as KRPPD, PARK9, HSA9947, RP-37C10.4. It encodes a 36 kDa lysosomal transmembrane protein containing 10 predicted transmembrane domains , which were previously shown to underlie a rare form of autosomal recessive juvenile-onset Parkinson dementia called Kufor-Rakeb syndrome . The patients afflicted with this syndrome manifest characteristics of not only typical NCL, but also show extrapyramidal involvement. Postmortem pathological examination of the brain tissues from a Kufor-Rakeb syndrome patient with homozygous missense mutations in the ATP13A2 gene showed extensive deposition of lipofuscin in the retina, cerebral cortex, basal ganglia and cerebellum . In most human tissues, CLN12-mRNA is detectable, but it is expressed at a high level in the ventral midbrain, including substantia nigra, and to a lesser extent in the kidney and skeletal muscle . CLN12/ATP13A2 gene product is targeted to the acidic compartments of the cell including the late endosome and lysosome [182, 183]. Cultured fibroblasts derived from patients with Kufor-Rakeb syndrome as well as ATP13A2-deficient cell lines have demonstrated that loss of this protein impairs lysosomal acidification, which in turn impairs the degradation of cargo by lysosomal hydrolases disrupting lysosome-mediated clearance of the autophagosomes [182, 184]. Recently, it has been uncovered that impaired CLN12/ATP13A2 function causes oxidative-stress in human neuroblastoma cells . Interestingly, oxidative-stress is found to increase the expression of the CLN12/ATP13A2-mRNA . A comprehensive review on this subject has been published linking its role as a cation transporter regulating Mn2 +, Zn2 +, Mg2 + homeostasis with H+ ions concentration in the cell . A pathogenic link has been suggested between CLN12/ATP13A2 and Parkinsonism as they both protect neurons against α-Syn toxicity. Since cation regulation and homeostasis are vital for neuronal function including intra- and inter-cellular signaling , the loss of transporter function of the ATP13A2 may explain the dysregulated neurotransmission and eventual dementia characteristic of CLN12 disease. The CLN13 gene encodes cathepsin F (CTSF) and mutations in this gene were originally reported in mice , which develop neurological disease with accumulation of autofluorescent material in neurons of the cerebral cortex, hypothalamus, cerebellar Purkinje cells and other regions of the brain. The neurological disease develops between 12–16 months of age and is characterized by the lack of coordination, muscular weakness and premature death. The pathological findings in the brain also include numerous activated microglial cells . Recently, 3 families with adult-onset NCL causing dementia and motor disturbances without epilepsy have been described [190, 191]. These patients carried rare mutations in the CTSF gene, which were identified after linkage analyses, and exome sequencing. CTSF is a cysteine protease consisting of 484 amino acids. It contains a 251-amino acid pro-peptide consisting of a N-terminal cystatin-like pro-region, which works as a cysteine protease inhibitor . Synthesized in the ER, CTSF is tagged with mannose 6-phosphate residues in the cis-Golgi and transported by CI-M6PR to the late endosomal/lysosomal compartment . CTSF is expressed at a high level in cerebrocortical, hippocampal and cerebellar neurons . Although CTSF is recognized as a lysosomal cysteine proteinase, its in vivo function remains obscure. Targeted-disruption of the CTSF gene in mice has been carried out and phenotypic characterization of the CTSF-/- animals shows that they are apparently healthy and reproduced normally. However, these mice manifested progressive weakness in their hind legs and declining motor coordination at 12 to 16 months of age. This was followed by significant weight loss leading to death. Pathologic analysis of the CTSF-deficient neurons showed accumulation of eosinophilic granules that had characteristics of lysosomal lipofuscin as well as elevated levels of autofluorescent lipofuscin, which are characteristic of all NCLs. These findings may indicate that CTSF either only mildly affects the phenotype or is mildly compensated by other gene product(s). Thus, the phenotypic manifestation of CTSF-deficiency requires a longer period for the manifestation of CLN13-disease symptoms . Progressive myoclonic epilepsy (PME) is a clinically defined epileptic syndrome that manifests as myoclonic seizures and progressive neurological dysfunction [194, 195]. Mutations in the potassium channel tetramerization domain-containing protein 7 (KCTD7) have been extensively linked to progressive myoclonic epilepsy . Moreover, homozygous mutations in the KCTD7 gene have been reported to cause a subtype of NCL discovered in two siblings in a Mexican family who presented with infantile-onset, progressive myoclonic epilepsy, cognitive impairment, loss of vision, motor regression, and premature death. Pathological analysis showed prominent NCL-type storage material . Further analyses showed that these patients carried a missense mutation in the KCTD7 gene and pathological analysis showed autofluorescent storage material characteristic of the NCLs. Currently, KCTD7 gene represents CLN14 . KCTD7 is a member of the KCTD protein family . It is a highly conserved protein consisting of 289 amino acids, and in the mouse, it is predominantly expressed in the cerebrocortical and cerebellar Purkinje cells as well as in the pyramidal cell layers of the hippocampus . It is a soluble cytosolic protein. The structure and localization of KCTD7 in various organs suggests that it is involved in hyperpolarization of the cell membrane via interaction with a component of the ubiquitin ligase complex . In a patch clamp study, it has been demonstrated that KCTD7 overexpression in murine neurons hyperpolarizes the cell membrane and decreases excitability of these cells. Moreover, KCTD7 directly interacts with Cullin-3, a component of E3 ubiquitin-protein ligases, for degradation by ubiquitin-proteasome system. Furthermore, missense mutations in the KCTD gene found in CLN14 disease, disrupt KCTD7-Cullin-3 interactions, which suggests that such mutations may impair cellular degradative process [197, 198]. How might emerging new roles of the lysosome clarify the differential pathologic manifestations in the NCLs ? The lysosome has been known as the major degradative and recycling organelle in the cell. However, it is increasingly being recognized as a “command and control center for cellular metabolism” . A clear understanding of the emerging new roles of the lysosome as a “regulatory Hub”  in the cell may clarify how mutations in 13 different CLN genes may impair lysosomal function. The endo-lysosomal pathway requires coordinated expression and action of various components that regulate the action(s) of the acid hydrolases, lysosomal acidification machinery, and the lysosomal membrane proteins. Recently, it has been reported that a motif (10 base pair sequence) near the transcription initiation site of many genes, designated as coordinated lysosomal expression and regulation (CLEAR), controls the expression of the genes that encode many lysosomal proteins . The transcription factor EB (TFEB), upon translocation to the nucleus, binds to the CLEAR element and promotes the expression of many genes encoding lysosomal proteins . Indeed, the CLEAR element is found in many genes encoding both non-lysosomal and lysosomal proteins including LAMP1, NPC1 and NPC2, β-galactosidase, CTSD, CLN3 and CLN5 . However, TFs other than TFEB may also regulate the transcription of proteins such as progranulin, which is associated with neurodegenerative disorders like FTLD and neurodegenerative LSDs like CLN11 disease . Notably, in the LSDs, the TFEB translocates from the cytoplasm to the nucleus activating its target genes. However, the phosphorylation of TFEB by mTORC1 prevents its translocation from the cytoplasm to the nucleus. These events attest to the fact that a genetic program regulates lysosomal biogenesis and function [201, 202]. It is noteworthy that the activation of mTORC1 impairs autophagy  and dysregulation of lysosomal acidification impairs autophagy in common neurodegenerative diseases like Alzheimer’s [44, 203]. Moreover, mTORC1 activation has been reported in JNCL  and recently, it has been shown that TFEB activation by mTORC1-independent pathway can be stimulated by suppression of Akt by trehalose, which appears to be neuroprotective and lifespan expanding in a mouse model of CLN3-disease . In virtually all LSDs including most of the NCLs lysosomal acidification is dysregulated [25, 26, 67]. Since dysregulation of autophagy has been suggested as a common mechanism underlying pathogenesis of the LSDs including the NCLs , suppression of mTORC1 activation is being considered as a therapeutic strategy for these diseases. Within less than a decade, the discovery that the lysosome responds to environmental cues by sensing the nutritional status of the cell and regulating both cellular clearance and energy production has opened a new era in lysosomal research. It has been reported that activation of mTORC1 localized on the lysosomal membrane regulates cellular growth and homeostasis . In this regulatory system, the nutrients in lysosomal lumen promote TFEB-phosphorylation catalyzed by mTORC1, which inhibits the activity of TFEB. Notably, inhibition of mTORC1 by its inhibitors like rapamycin, activates TFEB by its translocation to the nucleus. Similar results were obtained when the cells were starved to deplete nutrients like amino acids in the lysosomal lumen. Interestingly, the Rag GTPases in coordination with the v-ATPase-Ragulator complex sense lysosomal amino acids activating mTORC1. Thus, the lysosome appears to sense its luminal content to regulate its own biogenesis by an “inside-out” signaling mechanism, which requires both TFEB and mTOR [54, 205]. Notably, S6K1 is phosphorylated by mTORC1 and in the brain of Cln1-/- mice elevated p-S6K1 levels have been reported  suggesting dysregulation of mTORC1, which may impair autophagy. 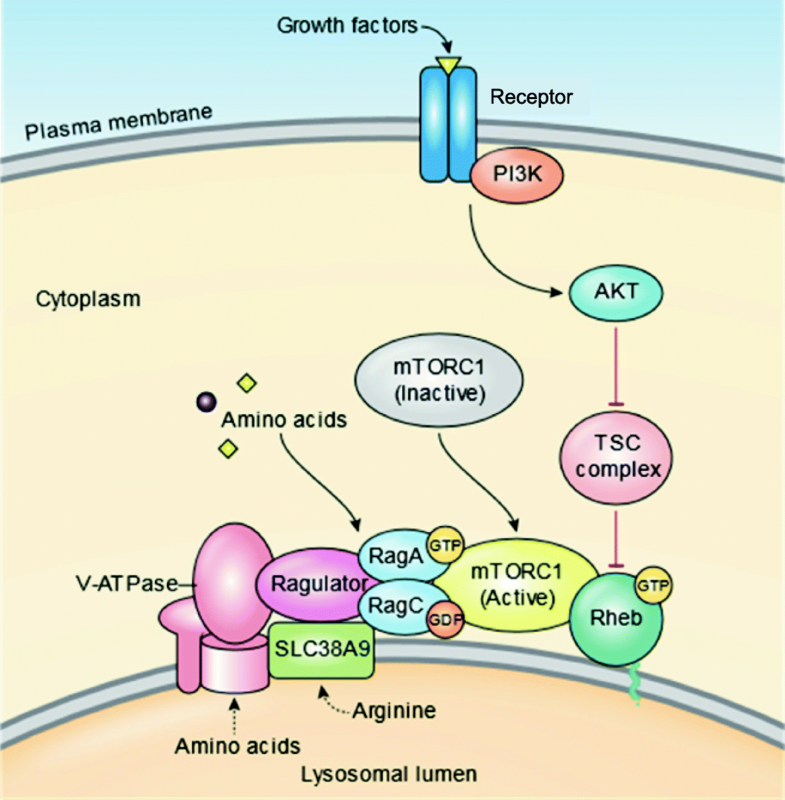 The mTORC1 is a multiprotein complex, which together with the Rag GTPases, Ragulator, and the v-ATPase, forms an amino acid-sensing machinery on lysosomal surface, which at multiple levels affects the decision between cell growth and catabolism . Moreover, diminished mTORC1-dependent JNK activation in Drosophila has been shown to cause neurodevelopmental defect. An elegant review on the roles of mTOR activation in several neurodegenerative diseases has recently been published . Although the mTORC1 signaling in NCL diseases has not been studied extensively, it has recently been reported that mutations in the CLN7 gene cause depletion of soluble lysosomal proteins, which impair mTOR reactivation . It is likely that mTOR signaling abnormalities may underlie pathogenesis of other NCLs besides CLN7-disease. Recently, it has been uncovered that in Ppt1-deficient Cln1-/- mice, the misrouting of V0a1 subunit of the lysosomal v-ATPase dysregulates lysosomal acidification . Since v-ATPase on the lysosomal membrane is one of the components of the nutrient sensing machinery which regulates mTORC1 signaling [Fig. 3], it is possible that mTORC1 signaling is defective in all NCLs including the CLN1-disease. This is one area of investigation that may provide insight into the pathogenesis of INCL. Interestingly, dysregulated lysosomal pH, which is also reported in many LSDs, impairs mitochondrial function and shortens lifespan in yeast . Cumulatively, these results demonstrate the importance of both cytosolic and lysosomal pH in cellular homeostasis and lifespan. Unlike those LSDs, in which the pathologic manifestations occur predominantly in the visceral organs, NCLs pose a significant therapeutic challenge. This is primarily because these diseases manifest mainly in the central nervous system, which is relatively inaccessible due to the blood-brain barrier. Moreover, in most of the NCL forms, the disease onset occurs in early childhood while in others the disease progression is very rapid; for a treatment to be effective, it needs to be initiated as early as possible to prevent significant neuron loss. Because the NCLs are rare diseases, most physicians are unfamiliar with their clinical manifestations. Thus, by the time a genetic diagnosis is firmly established, significant neuron loss has already occurred. Despite these obstacles, progress towards therapeutic development continues to be made. Among the therapeutic strategies, enzyme replacement therapy (ERT) as well as gene therapy for the CLNs are making steady progress. However, small molecules that are non-toxic, cross the blood-brain-barrier and mimic the function of the mutant gene may be a valuable addition to the other therapeutic strategies. Recently, attempts are being made to identify and characterize thioesterases-mimetic small molecules for the treatment of INCL. Since nucleophilic attack cleaves the thioester linkage in S-palmitoylated proteins (constituents of ceroid), it was reasoned that nucleophilic small molecules, such as cysteamine and N-acetylcysteine, alone or in combination, may have therapeutic potential for INCL. These compounds have been tested first in vitro using cultured cells from INCL patients . Based on the results of in vitro studies, a combination of these compounds has been tested in a clinical trial. While the results showed some modest beneficial effects, the patients eventually succumb to the disease . Further efforts to find more potent thioesterases-mimetic small molecules resulted in the identification of a non-toxic small molecule, N-tert-(Butyl) hydroxylamine (NtBuHA), which is undergoing pre-clinical testing in Cln1-/- mice. Treatment of Cln1-/- mice with oral NtBuHA showed its neuroprotective and lifespan extending effects in these animals . Pre-clinical studies on this small molecule are currently ongoing. Nonsense mutations in the CLN1 gene can cause INCL and the availability of nonsense- suppressors prompted the testing of at least one such compound, PTC124 . Previously, PTC124 has been tested in vitro using cultured fibroblasts and lymphoblasts from INCL patients to override the premature stop codons resulting from nonsense mutations. However, this treatment yielded only a very modest increase in Ppt1 enzyme activity . This study was followed by the generation of two Cln1-knock-in (KI) mouse models carrying a lethal nonsense mutation in the Cln1 gene commonly found in INCL patients in the US [213, 214]. In one study , PTC124 was tested in vivo using Ppt1-KI mice, which yielded promising results. Several ongoing preclinical studies demonstrating the efficacy of Ppt1 enzyme replacement therapy [215–217] as well gene therapy [218, 219] continue to pave the way for clinical trials in INCL patients. Recently, it has been reported that a commonly used GAP junction inhibitor, carbenoxolone (CBX), a compound that has been proposed to modify lipid microdomains and corrects defective membrane fluidity in Cln3-deficient endothelial cells, which ameliorates defects in endocytosis, caveolin-1 distribution at the plasma membrane, and Cdc42 activity . Remarkably, treatment of the Cln3-deficient mice with CBX improved the status of blood-brain-barrier and reduced autofluorescence. Since CBX has been used in humans it has been suggested that CBX and related compounds may have therapeutic potential for patients with CLN3-disease . The current and emerging therapeutic approaches are presented in several excellent articles [221–227]. More specifically, the current therapeutic approaches, which have reached pre-clinical or clinical trials, include CLN1, CLN2, CLN3 and CLN6 diseases (Table 3). Both small and large animal models of various forms of NCLs are being developed. These animal models are likely to be very useful for the preclinical evaluation of novel therapeutic strategies. In this regard, a recently published comprehensive review provides an extensive list of small and large animal models of various NCL forms . Detailed information on various clinical trials can be found in http://clinicaltrials.gov. The lysosome, with its uniquely acidic pH and acid hydrolases, is the terminal organelle shared by both endocytic and autophagic pathways of degradation. Since the discovery of the lysosome more than six decades ago, tremendous progress has been made towards identifying the mutated genes underlying LSDs. However, the mechanism(s) by which these mutations impair lysosomal function, causing pathogenesis of the neurodegenerative LSDs, remains poorly understood. Unravelling the complexity and molecular mechanisms that underlie the endo-lysosomal system and delineating the nature of the pathophysiology of neurodegenerative disorders in general remain a formidable challenge. Currently a major objective in the treatment of the LSDs and other common proteinopathic neurodegenerative disorders has been the substrate reduction and clearing of the lysosomes. Although this approach has been moderately successful in treating LSDs that involve the visceral organs, it shows limited benefits at best for the neurodegenerative LSDs like the NCLs. While we continue to learn more about the biological functions of the mutant genes, as related to the pathophysiology of these diseases, the development of mechanism-based treatment may be possible. The development of new vectors for gene therapy is another avenue that may be successful in the foreseeable future. The emerging new roles of the lysosome as they relate to the LSDs and common neurodegenerative diseases may further advance our understanding of the pathogenic mechanisms underlying these diseases and facilitate the development of novel therapeutic strategies. Correlation of basic and clinical data from different therapeutic trials may also contribute to our understanding of these diseases and further identify novel therapeutic targets. It is hoped that in the ensuing years, we will be able to address the following basic questions: (i) what are the critical elements that regulate the endo-lysosomal transport system and what makes this system dysfunctional in neurodegenerative LSDs; (ii) what roles do the lysosomal membrane proteins and their post-translational modifications play in regulating nutrient sensing and mTOR-signaling and how are they dysregulated in neurodegenerative LSDs; (iii) what are the critical elements that regulate membrane fusion between endosome-lysosome and autophagosome-lysosome and (iv) what mechanisms underlie dysregulation of lysosomal acidification in virtually all LSDs as well as in common neurodegenerative diseases. It has recently been proposed that since lysosomal acidification is dysregulated in most LSDs, reacidification of the lysosome may be one of the therapeutic approaches to be considered. Finally, we must aspire to understand what therapeutic interventions can counteract the above-mentioned dysfunctions and what interventions may have a positive impact to ameliorate these defects. Our efforts to answer the above questions may enable us to develop effective therapeutics for the neurodegenerative LSDs, which mostly affect children. We anticipate that advances in our understanding of the disease mechanism(s) coupled with the improved methods of restoring normal lysosomal function by small molecules that cross the blood-brain barrier, the development of novel strategies to deliver the missing gene product, and the generation of vectors to deliver gene therapy to the brain may lead to effective treatments for these devastating diseases. In summary, endolysosomal and autophagic dysfunction underlie most of the LSDs and neurodegeneration is a devastating manifestation in most of these diseases. Neuronal ceroid lipofuscinoses are the most common neurodegenerative LSDs that mostly affect children. Although the mutant genes underlying each of the 13 NCL forms have been identified and characterized, the physiological functions of the gene products remain poorly understood. Consequently, the pathogenic mechanism(s) of the NCLs remain elusive despite intense investigations. While major advances towards understanding the pathophysiology of the NCLs have been achieved more research is needed to arrive at the finish line. Despite the lack of mechanistic understanding of these diseases, progress is being made towards the development of effective therapies. In this regard, animal models are a very useful tool. Although replacement of the missing gene product and gene therapy approaches have made significant progress, and some are in clinical or pre-clinical trials, efforts to develop mechanism-based therapeutics should continue. Another area of research that needs more attention is the search for biomarkers for each of the NCL forms. The emerging new roles of the lysosome is an area of research that promises to yield new information on all LSDs including the NCLs. This work was supported in full by the intramural program of the Eunice Kennedy Shriver National Institute of Child Health and Human Development, National Institutes of Health. The authors regret not being able to cite all the literature in the field due to limited space and we apologize to those authors whose publications are not included in this review. We would like to thank Drs. Janice Y. Chou and Sondra W. Levin for critical review of the manuscript and for providing valuable suggestions during the preparation of this manuscript. The work devoted to generating this manuscript was supported in full by the intramural program of the Eunice Kennedy Shriver National Institute of Child Health and Human Development (NICHD), National Institutes of Health (NIH). No external funding was received by any of the authors. ABM wrote the first draft of the manuscript. The manuscript was further revised by ABM along with input from APA, MBB, TS, SC, AM and ZZ. Copy editing was performed by SC and MBB. All authors contributed in revising the initial draft, as well as reviewing, preparing and approving the final draft of the manuscript for submission. Lie P, Nixon RA. Lysosome trafficking and signaling in health and neurodegenerative diseases. Neurobiol Dis. 2018; pii: S0969-9961(18)30153-0. https://doi.org/10.1016/j.nbd.2018.05.015. di Ronza A, Bajaj L, Sharma J, Sanagasetti D, Lotfi P, Adamski CJ, et al. CLN8 is an endoplasmic reticulum cargo receptor that regulates lysosome biogenesis. Nat Cell Biol. 2018. https://doi.org/10.1038/s41556-018-0228-7. Ward ME, Chen R, Huang HY, Ludwig C, Telpoukhovskaia M, Taubes A, et al. Individuals with progranulin haploinsufficiency exhibit features of neuronal ceroid lipofuscinosis. Sci Transl Med. 2017; 9:pii: eaah5642. https://doi.org/10.1126/scitranslmed.aah5642. Galliani M, Santi M, Del Grosso A, Cecchettini A, Santorelli FM, Hofmann SL, et al. Crosslinked enzyme aggregates as versatile tool for enzyme delivery: Application to polymeric nanoparticles. Bioconjug Chem. 2018. https://doi.org/10.1021/acs.bioconjchem.8b00206.